Have you ever met a king before? I have. 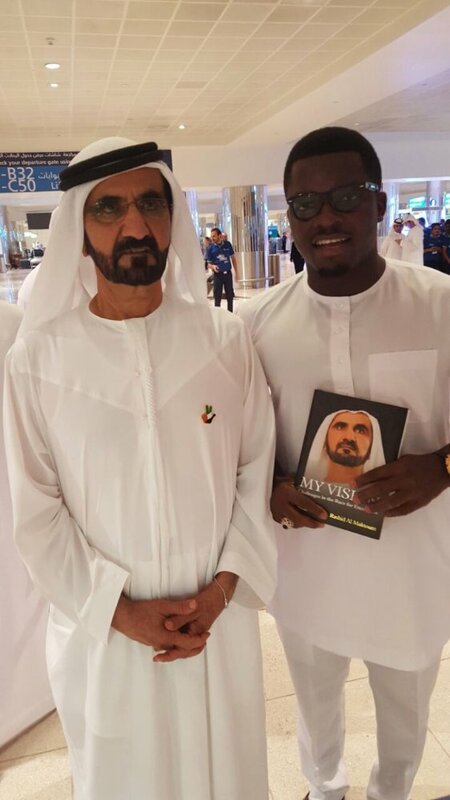 And, not just any king; but, His Royal Highness Mohammed bin Rashid Al Maktoum. A true blueblood who’s royalty isn’t his only claim to fame. An accomplished poet, an orator and a visionary Leader who has proved to the world that his people will not stand for mediocrity, rather are recognised as the leaders of the world in innovation. Consistently breaking boundaries and records that only they have achieved in the first place. It was with his “full throttle” approach that Sheikh Mohammed continued and expanded the Vision, based on the simple framework laid down by his father Sheikh Rashid bin Saeed Al Maktoum and his uncle, Sheikh Zayed bin Sultan Al Nahyan; giving the world “Destination Dubai” a great service to his country; the ultimate holiday and Financial Centre of the 21st century. As expected His Highness time is one of his most valued asset, hence my fleeting “2 minutes” meeting with the icon attested to the fact that that impossibility is ONLY a myth; you can become whatever you desire and your present situation has very little to do with your destiny. When I asked him what drives him, he said “Failure is not an option. Dubai can never afford to settle for less. The fear of failure is my number one motivating factor. I wake up each day reminding myself that I’d do everything to show the world that the UAE in general and Dubai in particular would never become followers but Leaders in all sectors of leadership. I asked for his advice for a young entrepreneur like myself: He said “…in life, you have to choose what you want to be, a Lion or a Gazelle, to succeed or fail, to be great or to be ordinary; whatever you chose to be you will become, but don’t forget that to be ‘2nd’ is to be ‘last’, strive to be the best”. 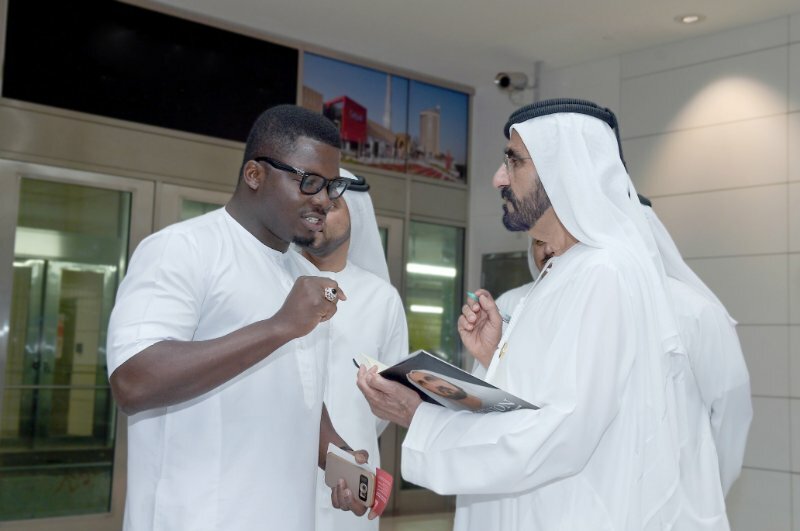 He eventually asked the purpose of my visit to Dubai and I explained my dream for “LorenzoBySujimoto”, I shared how Dubai inspires me and my desire to transform the Nigerian Real Estate sector. I was humbled by his rapt attention and amazed at his response: “your dreams are too small, double it, after you achieve it, contact me”. Signalling to his assistant “…give him my card” I was stunned almost in tears of joy. It’s an irony how different, people’s perspectives about the same subject can be. You see, I had shared this same dream for Lorenzo with a person I looked up to and the advice I got was “…be careful, this is Nigeria, this your dream is too big, take it easy…” Yet a King who knows virtually nothing about me, in a few minutes gave counsel that has filled me with hope and encouragement to go beyond the limits I had placed on my own dreams, otherwise not to start at all. I am grateful. I got a book, ‘The vision’, written by the icon himself, while signing my copy he asked “…what is your name again?” “Sujimoto” I replied; are you Japanese? We all laughed. As he moved on to his next meetings, he looked back at me and said: “Japanese, Nigerian, whichever you are; you must never forget generosity, it is an important element of success”. Dubai is a city that has experienced transformation from the land of desserts and camels, into the city of towers and marbles. How could one not believe in the power of possibility? The story of Dubai can be likened to a ‘grass to grace’ kind of story, where from nothing it has become something remarkable, outstanding. I have re-learned the lesson that if one has the right vision and the right people who believe in that vision, there is no limit to the kind and level of success that can be achieved and the quality of impact we can have on our society. Many dreams have been abandoned, because of the credence we assign to the reactions of the people we share them with. Indeed, more often than not, we heed advice that limit us and we permit the society to dictate what is possible or not. One cannot desire abundance and operate with people who are stuck in a mind-set of poverty. It is paramount that one surrounds one’s self with people who buy into one’s dream. People who are not handicapped by the proclivity to crouch and surrender, rather faith in the boundless capacity of man to exceed expectation; would feed your passion and validate your dreams. To become a world class goldsmith, get advice from Harry Winston OR Tiffany, not a bricklayer.